Well known as a powerful stone of communication and problem solving, Amazonite is as visually soothing as it full of balancing properties. Characterized by its harmonious deep blue-green color, this mineral has a unique history and a long list of benefits. Whether you are experienced in mineralogy or simply a lover of healing stones, read further to learn more about the exquisite properties of this incredible mineral. Amazonite was initially called the “Amazon Stone”. It is believed date back to the time of the early Egyptians. Originally, the mineral was believed to have come from the banks of the Amazon River. However, it turns out that Spanish explorers identified it incorrectly. They confused Amazonite with another similar looking stone found in the same location. Geologists now attest there are no such deposits in or near the Amazon. Often confused with Jade or Turquoise, Amazonite is a microcline (a member of the igneous rock family). It is easy to identify because of its elegant turquoise-green, sometimes mildly yellowish, color. (Fun fact: The most coming microcline known is granite.) Its color intensity will vary based on the slight changes in chemical properties of the gem. Colors range widely from a powdery, pale green to a vibrant sea blue. Often with unique creamy white veins that run throughout resembling delicate mesh or a spider web, traditional Amazonite stones will have an opaque sheen. 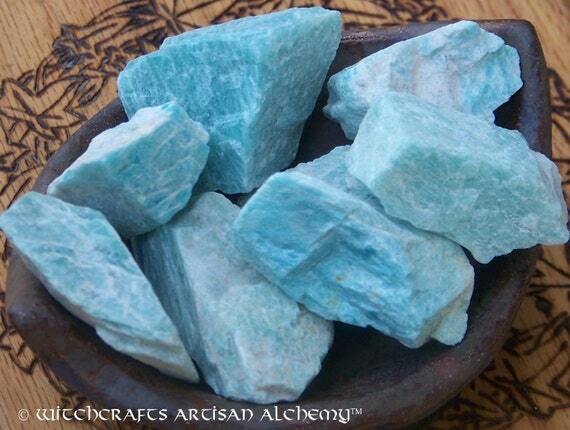 Also know as the chemical compound potassium aluminum silicate, Amazonite is part of feldspar family. Feldspars are the most plentiful mineral in existence. And while feldspars are the most common minerals on the planet, only a few of them possess the quality to be defined as a “gemstone”. Rated a 6 on the Mohs Scale (rating mineral hardness), it is hard enough to hold up well as jewelry and beads but is soft enough to be sculpted into unique cameos. The reason for its rich blue-green color has often been up for debate. Many mineralogists originally thought copper gave the stone its color; others believed it was iron. Current research confirms Amazonite’s coloring is due to lead impurities and water. Amazonite has many healing abilities. Linked to the throat chakra, it is known as a stone of clear communication. Many believe it helps in freedom of expression and thought. This also applies if one is having an especially difficult time telling the truth or speaking their true feelings. Additionally, Amazonite is a mineral of truth and thus tied in with the heart chakra. Perception and the ability to see other people’s points of view is also a key attribute. Amazonite is used for being grounded while facing difficult decisions but also provides an element of self-care in making these kinds of decisions. The cleansing of negativity and doubt is another one of its stabilizing factors. Positive affirmations are often done holding this stone. Many families keep Amazonite in their homes as they help diffuse stressful situations. These are also helpful to have in a tense work environment. Those with anger issues may benefit from its powers as well, including angst-ridden teens. Tied to the sign of Virgo, mineralogists believe that the deeper the stone’s color, the more intense its abilities. Amazonite also has the reputation of being capable of balancing feminine and masculine energies. Mythology states that the mineral was often used in the shields of female warriors. When polished and shaped, Amazonite is stunning paired with white gold or silver. But set against yellow gold, like in this slight necklace, gives it a classic, almost retro feel. The boldness of the color against the dainty gold elevates the stone’s beauty. Because of its affordability, an oversized statement ring is cost-effective yet makes an elegant addition to any collection. Set against a silver is reminiscent of water and the calming waves of the ocean. 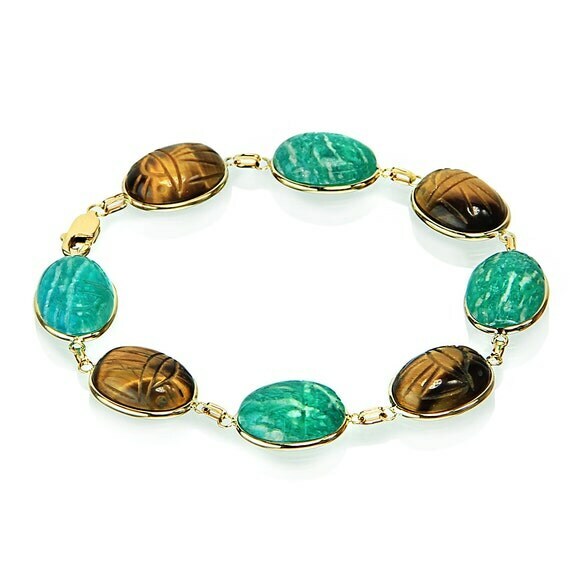 Amazonite, paired with Tiger’s eye, is thought to further elevate the ability to express true feelings clearly. The colors together reflect a uniting earth and water feel (even if it’s actually not from the Amazon River). As you now know, many individuals keep this stone in their homes and offices for balance. Consider placing a bowl of rough Amazonite as a decoration on a side table for its energy benefits. These would also make a lovely centerpiece at your next family feast. Where Can We Find Amazonite? Because of the copious quantities of this mineral, Amazonite is accessible and easily to mine. If you are in the United States, you can even find it locally in the state of Colorado (hence the nickname “Colorado Jade”) and even Virginia. Other plentiful areas are in parts of Russia, Madagascar, Australia, and even Brazil; ironically, not in the Amazon. Rare yet affordable, stunning yet simple, Amazonite is sure to add variety to your jewelry collection. Even more important than its aesthetic beauty are the invaluable mending powers it contains. Give this mineral as a gift to someone looking for hope and guidance in their endeavors. Purchase it for yourself to guide you in accessing your truth. The more you learn about this stone, the more you will appreciate the positive, life-influencing abilities it holds. Hey Buddy!, I found this information for you: "Amazonite – The Colorful Stone Descended from the Amazon". Here is the website link: https://accessgems.com/amazonite/. Thank you.